When I decided to add ProSnore to my list of anti snoring devices to try, I had only planned on ordering the original one. However, when I discovered how different the original one was from ProSnore II, I decided to give them both a chance. Usually, I select only one version because the differences are fairly minimal, but these are two very unique products, so I tried them both. Low profile design takes up minimal space in your mouth. Custom made in a lab for a precise fit. Product was designed by a doctor. Crafted from smooth plastic that is supposed to not be irritating. The extension tab rests in front of your top teeth and gums may cause irritation. Device may fall out of your mouth. No mention if the material is BPA- and latex-free. It takes several weeks to actually get the finished snoring mouthpiece. Design does not allow you to breathe through your mouth. ProSnore and ProSnore II mouthpieces both did not meet my expectations, and I do not recommend them. The custom fit didn't feel precise, and ended up causing some gum pain. ProSnore II offers an adjustment, but I found it to be annoying and still not that comfortable. The fact that ProSnore does not have an upper jaw tray distinguishes it from other stop snoring mouthpieces. When you think of a snoring device, you sort of expect the mouthpiece to touch your upper and lower jaw. ProSnore doesn’t. It only fits the lower teeth. To hold it in place there is an extension that rests on the front of the upper teeth and gums, thereby holding your lower jaw in a forward position. This tightens throat muscles to keep your airway clear of obstruction. Also, unlike most mandibular advancement devices (MADs), the fitting process is done for you. You are sent a clay impression kit as well as a stamped and addressed envelope. Simply follow the instructions to create a mold of your teeth in the clay and then you mail it to the lab, so your device can be made for you. I was actually really eager to try ProSnore. The idea of having only one tray in my mouth was pretty exciting. You can tell by looking at it that it is very streamlined, so it had “comfortable” written all over it. Sadly, this was another one of those lessons about not judging a book by its cover. First, I have to say the waiting period was quite long. The initial impression kit arrived pretty fast, and I sent it to the lab the next day. Then, it took nearly three weeks to receive. This just seems like a really long time. Anyway, when it arrived, I washed it to try out right away. I loved that it barely took any room in my mouth. My wife got one, too, and she was just as excited as I was. After a few minutes, I did notice that the extension piece that fits over your front teeth was rubbing on my upper gums. I really did not think it would be a big deal though. When we went to bed that first night, I instantly noticed the rubbing again. I thought that maybe my mouth just needed to get used to it. My wife’s didn’t rub her gum at all. Maybe my teeth are just an unusual size. Perhaps, if I stopped focusing on it, I wouldn’t feel so bothered. The dog woke me up shortly before dawn for a bathroom break. My wife was snoring away, and her ProSnore was not in her mouth. As I took mine out, I noticed how sore the front of my gums felt. Determined to squeeze in a couple houses of sleep before work, I actually put in my Good Morning Snore Solution (GMSS) that I knew I could rely on. The first thing we did when the alarm went off was search for my wife’s device, which we found under the bed. My wife is usually up before me, so the fact that she wasn’t up before my alarm went off told me she did not sleep well all night. Any excitement we had about trying ProSnore had fizzled by the time the second night rolled around. My wife really wanted her mouthpiece to work because she said it was so comfortable, but I did not even want to put mine in because my gums were raw. Plus, my allergies were acting up and ProSnore has no breathing hole, so I really was not sure how long it would last. The second night was a pretty close repeat. My wife’s did fall out, but not until some point after I let the dog out for his late night break. It was actually in, and she wasn’t snoring, but this all changed by the time the alarm went off. I should mention it was her turn to let the dog out, but since she was sleeping so soundly, I handled it. I was quite sure that would earn me points for something. As for me, I was exhausted. There were blisters forming on my gums, and I know it was not preventing my snoring or I would not have been so tired. We decided the third night would be the final night, unless there was a positive outcome. Let’s just say we were both in our favorite devices by midnight. 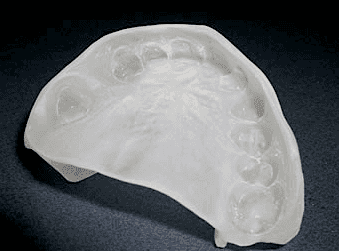 ProSnore II has a more traditional look to it, so it has an upper and lower jaw tray. It also features snap settings that allow you to adjust the placement of the lower jaw. This is done using a hook-and-loop material, so you are able to make very small adjustments at a time. Unlike its predecessor, ProSnore II has airflow holes at the front, so you can breathe through your mouth. This is good news for someone with nasal polyps, sinus issues, allergies, or a deviated septum. Like ProSnore, this version also gets custom made in a laboratory. After I gave my gums a week to heal from the ProSnore it was time to try ProSnore II. I was really hoping this one would be a huge improvement, and I tried not to form an opinion based on its unfriendly relative, but it was not easy. This one also came with an impression kit to send to the lab. The device felt okay but it was not the precise fit I was expecting coming from a lab. Truthfully, I have achieved a better fit using the boil-and-bite method in the past. The material was smooth, and fortunately there were no parts rubbing on my gums. Setting the lower jaw position was harder than I expected. If you pull the upper and lower tray apart it is actually not all that easy to line them back up. Mine clicked together crooked several times. I ended up using a setting in the middle. My wife selected the setting with the least amount of lower jaw advancement. This MAD was a lot more noticeable in the mouth than the first one. Although the device stayed in for both of us all night, they did not stop our snoring. We both felt tired in the morning as if we hadn’t slept at all. Our teenage son confirmed he could hear us snoring all night. For the second night, we both advanced the lower jaw a little more. Again, it was not easy to get the trays aligned. The next morning we felt the same. We had snored all night. My jaw was also noticeably sore from the advanced position. I was not really sure if I could handle much more, but we decided to go big or go home. I put mine on the most advanced setting and my wife moved the position on her device a little more. By the fourth morning, we were done with this trial. This mouthpiece was just not working for us. The only thing it did do was leave me with a very sore mouth. Airflow holes in front allow you to breathe through your mouth. Device gets custom made in a lab for a more precise fix..
ProSnore Ii allows you to change the position of the lower jaw. Custom fit may not be as precise as you hope for. Difficult to line up trays to snap them together. Snap design creates more crevices to harbor bacteria. Device takes a long time to arrive. I did not expect both devices to be perfect, but I really hoped that at least one would work. Both of us had no success with either mouthpiece. I appreciate that a custom fit can be made in a lab without a subscription, but I did not find either to be all that precise. Plus, they take a long time to arrive. ProSnore hurt my gums and my wife could not manage to keep the appliance in for an entire night. ProSnore II looked promising, but the fit just was not there and adjusting it was a big chore. Not to mention, my jaw was screaming at me for a week after trying it on more advanced settings. 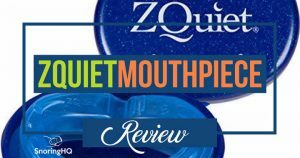 If you are set on wanting an MAD, checkout ZQuiet on my best snoring mouthpieces page. It is incredibly comfortable and effective. It is actually my wife’s favorite mouthpiece. If you want to try something a little different, check out GMSS. It actually suctions to your tongue, so there is not a mouthpiece actually in your mouth.